It seems to be a music-themed week here at Macworld, between Wednesday’s staff pick and Apple’s rumored deal to pick up Beats Music, so I thought it only fitting that today’s pick follow the trend. 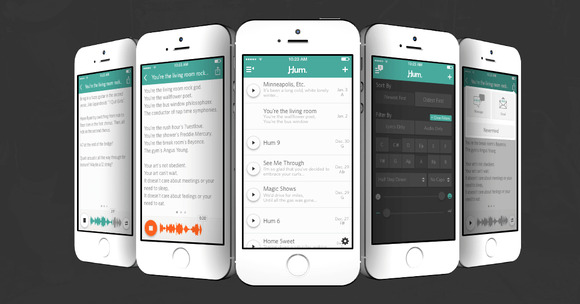 That pick is Hum, an impeccably designed little app for holding your songwriting snippets, lyrics, chords, and more. The Voice Memos app is all well and good for recording snippets, but they get lost quickly in the depths of your music library or the app. When I started writing songs back in the mid-nineties, I wrote them on scraps of notebook paper in-between classes and hummed into a tape recorder. As the years progressed and iPhones became my recording device of choice, the Voice Memos app was my “lyrics storage engine”—any time I thought up something good, I’d record it in Voice Memos, then transcribe it in plain text and store it in Dropbox. But there was no good way to associate those snippets with my lyrics, other than just dumping the raw files into a Dropbox folder and sorting them out later. Hum's a great place for putting cover songs you're working on, too. Seen here: Harvey Danger's "The Show Must Not Go On". It’s why I’m loving Hum: The app combines the vocal storage of Voice Memos with your favorite plain-text app to provide a place for you to note down lyric ideas and song snippets, add the key, tuning, and whether you’re using a capo; in addition, you can rate the song’s mood and volume, and add any notes you think up. The app is so simple to use it feels like cheating. It’s the best parts of Voice Memos combined with a Simplenote-like plain text app, with beautiful icons and a lovely flat teal color scheme. And separating your lyrics from your notes about lyrics is a wonderful addition. There are only a few things missing from Hum that would make it my perfect songwriting app. Dropbox sync, my top priority, is coming soon, according to the developers. It’d also be nice to be able to associate multiple recordings to a single entry—I’d rather not have to make “Bridges v1”, “Bridges v2”, and so on. (And if I did have to, it’d be nice to be able to “clone” an entry so that the lyrics could carry over.) There’s no way to import recordings from other sources into a song, either; granted, I’m not entirely sure if that’s possible via iOS’s Open In sheet, but if it is, it would be an amazing function to have. But those are minor quibbles when it comes to Hum’s promise in the songwriting field. For those who find themselves humming the perfect tune but have nowhere to store it, the app is a great little tool, and I can’t wait to see what updates are coming down the pipe. 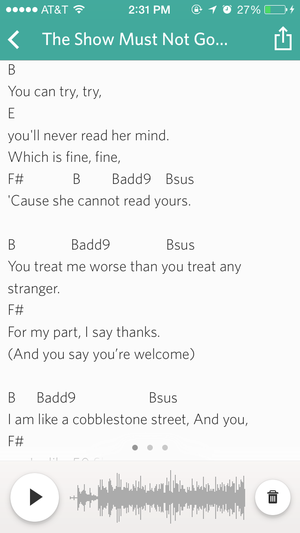 This beautifully-constructed little songwriting app is a great place to store your tunes, hums, lyrics, and notes.